Ohio State Buckeyes CFP Football College Game by Wilson | Sports Memorabilia! 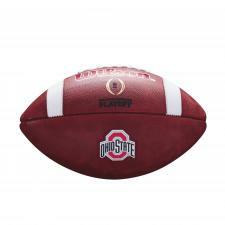 This is the official 1009 game model football as used in the Ohio State football home games. Made by Wilson Sporting Goods, this is a very nice printed football with the official color Ohio State foil logo. A must have item for any Ohio State fan. NCAA offiical leather football with a red Wilson logo.